There are many phrases that can describe life. Perhaps the 1997 Italian film put it best: life is beautiful. Other sufficient phrases include: life is precious, life is sacred, and life is a gift. Human life is truly a gift and should be treasured from the first moment of conception to natural death. Unfortunately since the 1973 United States Supreme Court decision of Roe v. Wade, life has not been revered as sacred, precious or a gift. Rather, it has been viewed as something that can be ended through the atrocity of abortion. The Sacred Scriptures highlight the gift of life given to us from God. The most well known being from the prophet Jeremiah “Before I formed you in the womb, I knew you” (1:5). 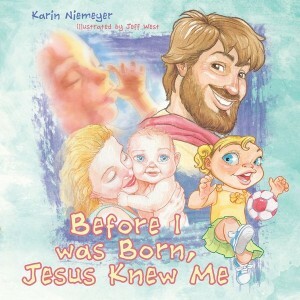 Karin Niemeyer, an elementary school teacher at Our Lady of the Pillar School in St. Louis, has penned her first children’s book which captures the essence of Jeremiah 1:5 — Before I was Born, Jesus Knew Me. Her story, which is beautifully told and illustrated by Emmy nominated artist Jeff West, presents in terms a child can understand the value and dignity of human life. In addition to presenting a story, Niemeyer includes scripture passages relating to the value of human life which are a tremendous asset for teaching. The story portrays the development of a baby while still in the womb of her mother and the joy that other family members experience. Vivid with detail about the life inside the womb, Niemeyer relays the movement of a child in the womb. The apex of the story apexes is the birth of the developing child and the gratitude her mother has after the birth. The ending to the story provides a reflective element relating how God has made each one of us in his image and likeness and how He calls us to follow after Him. Before I Was Born, Jesus Knew Me is a wonderful story that will instill within young children the value of life. In order to transform the culture we live in, it is vital to instill this in our children while they are still formable. Sharing Niemeyer’s story with your children and grandchildren will hopefully give them a brighter future and equip them with values that will last a lifetime. If you are a parent, grandparent, aunt, uncle, or educator, be sure to acquire copies for your family members, classroom, and school library so that all people can know that life is beautiful!